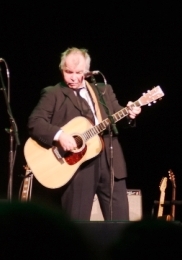 The last I saw John Prine perform on stage, he had a full flowing head of hair. That was 35 years ago. He performed many of his classic standards Friday and Saturday at the National Theatre in Washington, DC – 23 songs in all as well as from his latest album – The Singing Mailman Delivers. His hair was thinner, but his smile, despite the effects of oral cancer, was infectious. And the music was fresh. He and his accompanists were dressed well, all suited up with ties, as though to say that they are accompanying a legendary song writer. And they were. Bob Dylan counts John Prine as one of his favorite songwriters. John Prine telling stories and singing his classics at the Washington Theatre. The National Theatre was packed. One audience member I spoke with, wearing some of his Vietnam Veteran patches, recounted numerous Prine performances he had gone to throughout the years. He reminisced how, as John Prine survived two bouts of cancer, and how after each battle, his voice changed, getting gruff, getting richer perhaps, like a fine wine. At one point, Prine recollected how he had viewed unnamed old people, how they had so many stories to tell, and how he wanted to learn of their multiple experiences. “That’s what I wanted to be, an old person!” “Yeah baby!” an audience member responded. Then Prine rolled into Hello in There. While Prine’s performance Angel from Montgomery, as well as Souvenirs, Iron Ore Betty, and Mexican Home, were passionate, his rich thoughts as a songwriter, transmuted into others’ music is equally powerful. And Prine’s Angel from Montgomery is so natural, as he is truly a singer’s songwriter. He gives the lugubrious ballad an undeniable authenticity, richness and emotive depth that makes the song timeless. In that spirit, he invited Amanda Shires to join him in duets for two songs; In Spite Of Ourselves and Unwed Fathers. Shires’ distinctive Nashville twang and talent made her a great pairing to Prine’s undeniably classic performance. He then sang Sam Stone – a song about veteran addicted to the needle, to the great appreciation of the audience – one of his many songs about veterans. He bowed, and after an encore, he exited gracefully, leaving us wanting more. John Prine is an American treasure.